Remember the bot that sues Equifax for data breaches that made headlines last fall? Although celebrated by most of the #altlaw crowd, surprisingly, the bot wasn’t as well received by many of the solo and small firm lawyers on one of my listserves. Many of these lawyers expressed concerns about the ethical implications of the bot. For example, one attorney characterized the bot as a “non-attorney engaged in the practice of law” and worried that even if he were to use the bot himself, he would be furthering unauthorized practice of law by a non lawyer in violation of ethics rules. Another lawyer wondered if she could face liability for negligent referral if she provided clients a link to the bot and the bot subsequently botched the case. To most in the #altlaw space, these lawyers’ worries about the Equifax Bot reflect the kind of ridiculous lawyering (overanalyzing issues and neglecting common sense) that the public has come to despise. But mocking solo and small firm lawyers for imagining the parade of horribles that will flow from innovation doesn’t solve the problem. For starters, solo and small firm lawyers who innovate themselves or participate in new models actually do face risk (albeit small) of ethics prosecution or judicial sanction See examples here , here , here and here. And even if #altlaw doesn’t care about the fate of solo and small firm lawyers, the risks associated with legal innovation are scaring investors away from the legal tech space. Believe it or not, there’s a more practical solution to this conundrum than simply waiting around for lawyers to become irrelevant or extinct. The answer: insurance. 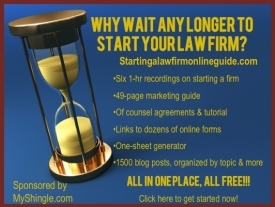 Right now, many solos and smalls don’t know whether their malpractice policies would cover negligent referral to a bot or a lawsuit arising out of participation in an online platform like Avvo Advisor which several state regulators prohibit as fee splitting between lawyers and non-lawyers in violation of ethics rules. Development of new and more importantly affordable malpractice insurance products to cover the emerging risks that solos and smalls face when participating in innovative business models or introducing them in their own practices would provide the kind of assurance that solos and smalls need to take the leap to experiment. Moreover, involving malpractice insurance carriers more actively in new innovation efforts would generate the kind of data that regulators lack on whether these novel services are actually harming clients. (spoiler alert: my hunch is that they don’t). The role of legal malpractice in removing barriers to innovation is evident in two relatively recent developments in the legal space: unbundling and the cloud. Over the past decade, as malpractice insurance carriers have realized the growing demand for unbundled legal services, they have supported these initiatives with training and guidelines for lawyers who seek to incorporate unbundling into their practices . With guidance from carriers and insurance coverage for cases that don’t go as planned, many more solo and small firm lawyers now feel comfortable offering unbundled legal services. The cloud is another example. Although many solos and smalls irrationally feared that storing data in the cloud could result in breach of client confidentiality or loss of data, today, many malpractice insurance carriers offer cybersecurity coverage that addresses these concerns. Cybersecurity insurance has now come down in price, making it more affordable for solo and small firm lawyers. In fact, when I renewed my malpractice insurance this past year, a purchase of cybersecurity was the default option that had to be declined in writing if not purchased. What would innovative legal malpractice coverage look like? For starters, it would expressly cover lawyers who choose to participate in online referral platforms and markets. But the cost would be lower and perhaps even on a per-case basis given the intermittency of work that comes through platforms. Perhaps by reducing coverage rates sufficiently, many of the online platforms that feed work to lawyers could also subsidize coverage and in turn, attract more lawyers to the platform. Carriers could also make insurance packages available for law firms that introduce novel subscription or DIY services. It’s not clear whether these products would be covered under traditional malpractice programs and in any event, the fees for those packages might not be affordable. Special products or add-ons for subscription or DIY services could be tailored to anticipated problems and priced accordingly. Special malpractice offerings for unique services would increase lawyers’ confidence in offering them. There are two ways for legal tech to move forward. We can try to persuade regulators and legislators to change existing laws – which isn’t likely to happen anytime soon. Or, we can encourage more solo and small firm lawyers to come on board with new technology by acknowledging and reducing the risks that they face by creating and offering new legal malpractice insurance products for innovation.